How can I apply for a job with MGM Resorts International? So you’re interested in joining our team? Fantastic! Find out more information on Careers with MGM Resorts International on our website. Yes, we have an entertainment loyalty program called M life Rewards. Our loyalty program is more than a casino loyalty program; our members earn rewards for hotel, dining, entertainment and gaming activity at any one of 16 MGM Resorts International destinations nationwide! Find out more about the M life Rewards program here. Do you offer Dynamic Currency Conversion? Dynamic Currency Conversion is a convenient service that offers international guests a choice of paying for their room and purchases in their local currency or US Dollars. All of the MGM Resorts in Las Vegas offer this service to our guests at the Front Desk, VIP Lounge, Pool Operations, and via the Contact Center as well as Casino Marketing. There are no hidden fees and the exact price is known at the time of the purchase or charge. This benefits guests in offsetting existing fees directly associated with international credit cards and is available in International MasterCard and Visa transactions. Our Detroit, Biloxi, Tunica and National Harbor Resorts do not offer Dynamic Currency Conversion services. Borgata resort in Atlantic City offers dynamic currency conversion services through NRT kiosks. What does LET stand for on my ticket? LET stands for Live Entertainment Tax. Click here for more information about NV LET. What is the average temperature in Las Vegas? Seasonal temperatures range from 34° F (1° C) to 58° F (14° C) in the Winter, 60° F (16° C) to 88° F (31° C) in the Spring, 74° F (23° C) to 103° F (39° C) in the Summer, and 54° F (12° C) to 82° F (28° C) in the Fall. For specific temperatures we suggest using a weather service, such as Weather.com, to find detailed information about Las Vegas weather. What time zone is Las Vegas in? Can I connect with MGM Resorts International on social media (Facebook, Twitter, YouTube…)? Can I chat with someone online about my reservation? Currently we do not have online chat capabilities. Contact our Central Reservations team at 855.788.6775 who will be happy to assist your needs. What’s new in Las Vegas for 2019? There’s always something new happening in Las Vegas. Use the MGM Resorts Entertainment Guide to find the hottest shows, concerts, and other entertainment coming to Las Vegas in 2019. What is the MGM Resorts Mobile App? The MGM Resorts Mobile App is a wonderful way for you to curate your MGM experience through your mobile device. You can access all of our dining and entertainment offerings. The MGM Resorts Mobile App has M life Rewards enrollment capabilities and gives existing M life Rewrads members access to their M life Rewards Tier Credits, Points, and Express Comps balances. I'm not interested in booking a room reservation. Can I still use the application? The MGM resorts Mobile App does more than just book room reservations. The app grants you access to dining, entertainment, and hotel information. You can also book dining reservation and purchase tickets to in-house shows (iOS users only). Is there a fee to download the MGM Resorts Mobile App? The MGM Resorts Mobile App is a complimentary service available in the App Store and Android App Store at no charge. Like other mobile apps, standard data and message charges may apply (depending upon your carrier plan) when you use the MGM resorts Mobile App. What languages are available in the MGM Resorts Mobile App? The mobile app is available in English. I booked my room reservation through a third party such as Expedia, Travelocity, Orbitz or other travel partners. Can I still use the MGM Resorts Mobile App to check-in? Yes, we do allow third party reservation check-in through the app. Please input your confirmation number that was provided to you and follow the prompt to check-in. You must be an M life Rewards member to check-in through the mobile app. I downloaded the mobile app to skip the check-in line. Why is it prompting me to visit the front desk? There may be issues with your credit card or we may need to verify your ID. We require each guest, who has not previously been ID verfieid, have a front desk agent manually check your photo ID to confirm that you name matches the reservation. The name on your ID must match the reservation. How can I check-in with the MGM Resorts Mobile App? Your reservation will show in the app within seven days of your check-in date and you can start to check-in 24 hours prior to the arrival time you selected upon booking.Once you receive the 24-hour mark notification, the app will notify you that check-in is now available as long as you have agreed to accept notifications and/or your settings are set to accept such notifications.If "location access" is enabled and the check-in process is completed in the app, and you are within 20 miles of the property, the app will add you to the top of the room queue and when a room is available it will automatically assign your room.Rooms will be automatically assigned up to two hours prior to arrival when a room becomes vacant and clean. I checked in with the MGM Resorts Mobile App and I am still waiting for the notification to tell me if my room is ready. What I should do? This sometimes happens when you opt out of in-app notifications or otherwise change your notification settings. How can I check-out with the MGM Resorts Mobile App? You will receive a check-out email with your bill before 11:00 AM on your departure date with instructions on how to check-out. You will also have the option to purchase late check-out, based on availability. If you'd like to pay your bill with cash, you must see the Front Desk. If you do not recieve a check-out email, please visit the Mobile Check-in Area on property. The application is prompting me to see a front desk agent upon my arrival. Is this necessary? Please visit a front desk agent in the main lobby as there may be changes to your room reservation and/or questions regarding your billing method. How do I request a donation from MGM Resorts? The social investments made by MGM Resorts International are dedicated to strengthening the communities where our employees live, work and care for their families. For this reason our charitable contributions are focused in Nevada, Mississippi and Detroit, Michigan, and our giving areas focus on development of at-risk youth, public education, community development and diversity. If your request falls within these geographic and giving priorities, please visit our website at www.mgmmiragevoice.com for more information. Do you offer gift cards & how can I purchase one? Do you have an electric car charging station? Bellagio, ARIA, Mandalay Bay, MGM Grand Las Vegas, The Mirage, New York-New York, Luxor and Excalibur in Las Vegas and Borgata in Atlantic City. Parking fees may apply. Please contact your resort for more information about its Electric Vehicle Charging stations. Do you offer travel agent rates? Yes, all of our properties have travel agent rates. Travel agents can use the IATA field to receive their commission on reservations on our online reservation system. Travel agents looking for discounts on their own reservations can show their ID at the front desk or call our central reservations line at 855.788.6775 for more details. Do you have internet access in the rooms? Yes, all of our properties have in-room internet access. How can I mail something to a guest? Address the package to the Hotel at which the recipient is staying. Be sure to write the recipient's name on the package, followed by the words "Hotel Guest" and their arrival date. The Business Services Center at the resort will notify the guest of their package. All packages are subject to a processing and delivery fee based on the weight of the item. For more information contact the resort where the guest is staying. If I’m not staying at the hotel, can I use your spa/salon? Yes, each of our resorts has various rates for spa and salon services. You can find the details for hours, services, and photos of our spas and salons on our website. Please contact our concierge at the resort the recipient is staying at for information on ordering special amenities. Are children permitted at the hotel? Children of hotel guests and non-hotel guests are allowed if accompanied by an adult. Please note you must be 21 years of age to enter the casino or any gaming area. Can I purchase the sheets and bedding from my hotel room? Some of our properties do offer the option of purchasing sheets and bedding. Please contact the concierge at the resort for more information about purchasing hotel bedding. Nevada, Mississippi, Detroit, Atlantic City and National Harbor guests must be 21 to gamble on the casino floor. National Harbor guests 18 and over can place bets in the sports book. Learn more about the legal ages to gamble at U.S. casinos. How old do I have to be to drink? You must be 21 years of age or older to consume alcohol at any MGM Resorts International destination. Do you cash traveler’s checks and is there a charge for doing so? You may obtain a Marker Limit Application on our website. The marker limit forms contain specific directions for processing the application. You are also able to call and request a marker limit application with our Casino Credit Department at 800-929-9413. Do you have wedding chapels? Our Las Vegas Resorts - Bellagio, ARIA, Mandalay Bay, MGM Grand Las Vegas, Luxor, Excalibur and Circus Circus have wedding chapels. Additional wedding venues & planning information is available on our website. Borgata in Atlantic City does not have a wedding chapel but has multiple wedding venues, including the Water Club. Beau Rivage in Biloxi, MS does not have a chapel, but there are multiple settings to choose from including Ballrooms and Waterfront wedding venues. Park MGM, Mirage, Vdara and The Signature at MGM Grand in Las Vegas do not have a chapel but do have other wedding venues available for ceremonies. Gold Strike in Tunica, MS; MGM Grand Detroit, and MGM National Harbor do not have wedding chapels. How can I get more information about wedding packages at your resorts? You can view many of the wedding packages online on our website. You can also request more information about wedding services from any of the MGM Resorts destinations. Our Las Vegas resort concierge team can arrange tee times at a number of Las Vegas golf courses or at the new TopGolf driving range, located near the MGM Grand just a few steps from the Las Vegas Strip. MGM Resorts International Beau Rivage Resort in Mississippi has exclusive access to the Fallen Oak Golf course. Our concierge team at other resort destinations in Detroit, Tunica, National Harbor, and Atlantic City can arrange golf tee times at local golf courses as well. How do I book a conference suite or room? Hospitality and conference suites can be booked online at MGMResorts.com. If you need to reserve a block of rooms contact MGM Resorts Social Occasions to assist in booking small conference suites & rooms. How can I find out about special offers and promotions? To learn more about resort offers and special promotions, please visit our Offers page. For the best offers and to stay up-to-date on our promotions sign up for M life Rewards. How old do you have to be to make a hotel reservation? You must be 21 years of age to make a hotel reservation at any of the MGM Resorts destinations. Do you offer AAA, Military or Government Rates? All of our properties offer special rates for AAA, Military, and Government. Please call central reservations for more information or view the offers page for more information on special rates and promotions. Can I make/change/cancel an existing room reservation? You now have the ability to look up your upcoming room reservations and modify the reservation online.This new feature gives you the ability to change your arrival date, departure date, early check-in time and late check-out time. You are still able to call central reservations at 855-788-6775 for assistance as well. Please note if you booked through a third party (i.e. Expedia, Bookit, Travelocity, etc.) you will need to contact them to make any changes to your reservation. Yes, please call central reservations at 855-788-6775 for assistance with booking a reservation at MGM Resorts International destinations. For the best hotel rates guaranteed book directly online. How do I add someone to my reservation? Please call central reservations at 855-788-6775 for assistance with making changes to your room reservation. What security deposit is required for a reservation? At the time of booking a hotel room, MGM Resorts requires a deposit of the first night’s room and tax. The first night's deposit is fully refundable provided notice of cancellation is received by Room Reservations at least 72 hours prior to the arrival date, unless specifically excluded by booked offer. What is “Best Rate Guaranteed” mean? If you find a lower third party room rate within 24 hours of booking on our website for our Las Vegas resorts, we will not only match that rate, but give you an additional 10% off the lower rate. What does “Run of House Room” mean? The “Run of House Room” means you will have a bed type assigned at check-in. You will need to work with our Group Sales Department for booking rooms of 10 or more. You can find group information on our website, request more information through Cvent RFP, or you can contact Group Sales through our Central Reservations line at 855-788-6775 for more information. How can I book connecting or adjoining rooms? Contact our Central Reservations team at 855-788-6775 for assistance with connecting rooms. Please note these requests are not guaranteed and certain room types do no connect. Please contact Central Reservations at 855-788-6775 to add an additional name to a reservation. A single person can make reservations for multiple rooms, but we encourage all guests staying at the resort to have their name assigned to rooms. Having all names attached to the reservation ensures check-in is as smooth as possible. Guests can book less than nine rooms online, for more than nine rooms please contact MGM Resorts Social Occasions. How do I obtain confirmation of my room reservation? All guests should receive a confirmation of their reservations shortly after booking. M life Rewards members can access their reservations and confirmations online. All other guests should contact our Central Reservations at 855-788-6775 to obtain copies of confirmations or folios. Guests can request an upgrade at check-in. To find out and confirm an upgrade before you arrive, please Central Reservations at 855-788-6775. Do you offer a discount to Las Vegas Locals? We offer local discounts to multiple shows however for room reservations it will vary based on property. What is a credit card authorization form & why do I need one? Credit card authorization forms are required for you to pay for someone else’s room and tax during their stay without you being present to show the credit card. Contact the specific resort to obtain the authorization form. All guests will still be required to present a credit card at check-in for incidentals for the room. Do you offer last minute travel deals? Yes, MGM Resorts occasionally features last minute and limited time offers for guests. Please consult our special offers page for current deals. Yes, all MGM Resorts International destinations offer the option for self-parking and valet parking for guests and visitors. Please click here to find out more information about parking at our Las Vegas Resorts. Parking at our Detroit, Biloxi, Tunica, and National Harbor resorts is free for our guests. The Borgata in Atlantic City offers both valet & self-parking with a $5 fee per visit. The Water Club at Borgata only offers valet parking with a $10 fee per visit. How many guests are allowed in the room? The number of guests allowed per room varies by the specific room type reserved. You can find this information in each room type details throughout the online booking process. Are roll-a-way beds or cribs available? Available for a fee at: ARIA, Bellagio, Delano, Excalibur, Luxor, Mandalay Bay, Park MGM, Mirage, and New York-New York. These are free of charge for guests staying at our Las Vegas resorts. Some properties offer a traditional crib, others provide a portable crib. The MGM Grand Detroit also offers cribs to guests staying at the resort; fees may apply, please contact Housekeeping for details. Do you have private pools? Some of our resorts have room types that come with private pools. We recommend you call the Central Reservations at 855-788-6775 to guarantee a room type with a private pool. Do the hotels offer room accommodations for the physically challenged? All of our resorts offer accessible room accommodations. The accessible features will vary from property to property. We recommend using our website to find the details about our accessible room types. As of March 15, 2011 only dogs are recognized as service animals (with the exception of miniature horses in a few cases). Aside from assisting the blind, deaf, and/or wheelchair bound guests, service dogs are also acceptable in assisting in calming a person with PTSD (Post Traumatic Stress Disorder). Please contact Central Reservations at 855-788-6775 to let us know you will have a service animal. Bellagio, Vdara, Mandalay Bay, Delano, and Mirage are dog friendly resorts in Las Vegas. The Borgata in Atlantic City is also pet friendly. The Beau Rivage is a dog friendly hotel in Biloxi, MS. Service animals are welcome at all MGM Resort destinations, please contact Central Reservations at 855-788-6775 to let us know you will have a service animal. Restrictions and fees apply. Please note dogs are the only pets allowed on property. Can I guarantee special room requests? All requests are based on availability. Most of our guest rooms are non-smoking. Some of our resorts are entirely non-smoking, such as The Signature at MGM Grand, Vdara, and Delano in Las Vegas. Please use our website to find out more information about smoking and vaping at specific resort destinations. MGM Resort destinations in Las Vegas, Detroit, Biloxi, Tunica, and National Harbor do not offer childcare or babysitting services. The Borgata in Atlantic City does offer babysitting services; please contact Borgata concierge 48 hours prior to arrival to secure babysitting services. For all other resorts, contact your resort concierge for assistance on finding childcare while on vacation. Where can I check or hold my luggage? The Bell Desk at your resort is happy to assist with checking/holding luggage. What kinds of rooms are available for large parties or guests with children? There are many room types available at MGM Resorts destinations that are suitable for groups and families wishing to stay together. Use our website to view all the different types of rooms at MGM Resorts destinations to find one right for your family getaway. Do you provide coffee makers in your guestrooms? Coffee makers are available in some of our room types at our resorts. We encourage you to review the room amenities on our website before booking to confirm if the room has a coffee maker. Yes all of our guest rooms at all of our resorts have complimentary hair dryers for use. Do you offer iron/ironing boards in the guestrooms? Yes all of our guest rooms at all of our resorts have complimentary irons & ironing boards for use. Amenities vary by room type and location. We recommend you review the hotel room types available at each destination to find specific amenity information. Does your hotel have a workout facility? The MGM Resorts destinations all feature fitness facilities; however, specific equipment and services in the gyms vary by resort. Are refrigerators available in the room? Luxury suites at our resorts all include refrigerators. In Las Vegas The Signature at MGM Grand, Vdara, and Hotel 32 also include refrigerators in their rooms. All other Las Vegas resorts offer refrigerators for a fee. When is the 2019 pool season? Pool season generally is between mid-to-late March through late October, pending on the weather. Most properties will still have a pool open year-round for guests to use. Please visit the pool pages on our website for more information regarding opening dates for each pool. MGM Resorts destinations do not include a complimentary breakfast with each reservation. We sometimes have offers that include dining credits, please review the current offers available on our website to see if one is available for your stay. Yes, all of our properties have an AVIS agency on site. Phone: 800-729-3563 (speed dial 958), If you’re at the resort, press #1 for the AVIS call center which is available 24 hours. Do you provide a shuttle or transportation to and from the airport? MGM Resorts does not offer shuttle service; however shuttles are available at the airport and will bring guests to our properties for a fee. Taxis are also readily available, and if desired, guests may rent a limo, or reserve a ride-share such as Uber and other rideshare programs to pick them up or drop them off at any MGM Resorts destination. Do you provide wheelchairs and/or scooters? Wheelchairs and scooters are available at all of our properties for a fee. To guarantee a wheelchair or scooter, please contact the Concierge at the resort you’re staying. Do you offer RV Parking? Some of our resorts provide oversized parking, or RV parking, for guests. RV parking is available at ARIA, Bellagio, Luxor, Mandalay Bay, and The Mirage. We recommend contacting your resort concierge prior to arrival to ensure there is space for your oversized vehicle or RV. If you are looking for a place to stay and camp on the Las Vegas Strip only, we recommend the RV Park at Circus Circus. Can I express check-in with my mobile device? MGM Resorts guests who have access to mobile check-in will receive an email 24 hours prior to arrival so that they can pre-check-in using their mobile devices at all destinations. Once at the resort, guests will need to verify information at the resort either by kiosk or with the front desk. Guests can purchase an early check-in by selecting the option during the booking process online. Other early check-in requests are based on availability. Late check-out is available for a fee and is based on availability. Contact the front desk during your stay for availability options. If a credit card was supplied at check-in, your bill will be emailed to you on your day of departure. If charges are accurate, you can depart your room and use one of the key drop boxes. Some resorts offer television and mobile check-out express options. The departure date will be confirmed during the check-in process. In the event a guest decides to check out prior to their confirmed departure date, they will be charged an early departure assessment in the amount equal to the applicable rate and taxes they were quoted for the night they are departing. Guests may change their departure date without penalty at the time of check-in, depending on the terms of the rate which they have reserved. How do I get assistance with my luggage? The Bell Desk is happy to assist with luggage. What does “Green Advantage Meetings” mean? MGM Resorts is dedicated to providing support and services to help organizations, who share the same passion for environmental responsibility, extend these values when planning a meeting. A green meeting is an event in which environmental considerations are incorporated into planning and execution in an effort to minimize the environmental impact. Can I get a map of the property? Property maps are available at the front desk of many of our resorts. 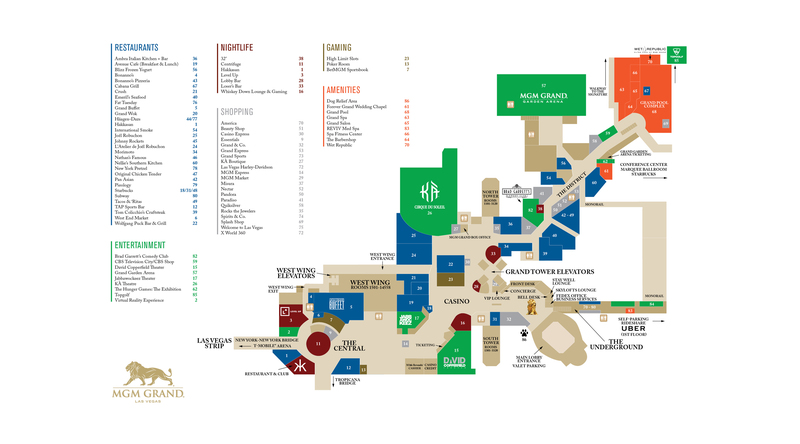 In addition, PDF versions of the property maps can be downloaded from each of the Hotel pages on MGMResorts.com. Please note that e-cigs, vapors, hookahs, marijuana etc. fall under our non-smoking policy. Cleaning fees will be applied to smoking in areas that are non-smoking. We do have designated smoking areas throughout the casino, bars, and other areas of many of our resorts. Contact a resort employee for location information regarding designated smoking areas. All of our properties have pools. Can we use the pool after we check out? Yes, guests can use the resort pool on the day of departure. If guests have checked out of their hotel room, they will not be able to bill back to the room from the pool café, lounge, or bar. Do you have a kid’s pool? Our resorts do not offer pools specifically for children. Do you have an adults-only pool? The following properties offer pools that are Adult (18+ years) only: ARIA, Bellagio, Excalibur, Mandalay Bay, Mirage, MGM Grand, and The Signature at MGM Grand. There is more information about each of our resort pools on the website. Do you have a lazy river? In Las Vegas both the MGM Grand and Mandalay Bay offer lazy rivers. How can I book a cabana at the pool? Guests can book a cabana online. In addition, you can contact your concierge to assist in booking a cabana on the property. Some pools offer cabana reservations to guests and resort visitors. Do you have a seating chart for shows? For many of the resident shows at MGM Resorts guests will have the option to review the seating chart for the theater before they book tickets. Use the online Entertainment Guide to find and book tickets for a show, concert, or event during your next vacation. Can I pick up tickets for a show at another property at the Box Office? Some show tickets are available to print at home. For other show tickets you must pick them up at the box office at the resort the show takes place. I lost my tickets to the show, what do I do? If you lost your tickets you must go directly to the Box Office no earlier than 15 minutes prior to show time to have a lost/stolen voucher issued. How can I get information or make a reservation for the Spa or Salon? Guests can find information about each of our Resorts’ spas and salons online at MGMResorts.com. There is an online reservation form, services menus, as well as contact information for each spa or salon for more information. Can I make a spa or salon appointment online? Yes, you can book a spa reservation or salon appointment online by first selecting the resort where you would like to make a reservation. Click here to select the resort. You can make a dining reservation online from any restaurant information page or you can contact Central Reservations at 855-788-6775. How do I sign onto the hotel Wi-Fi? Directions for signing on to the hotel Wi-Fi are available at the front desk of each resort. If you did not receive directions at check-in please call the front desk. All Las Vegas resorts have business centers. How can I send or receive a fax at the hotel? Yes, please contact the Business Center at your resort for more information. How can I make tour, travel, or sightseeing arrangements from the hotel? Our Concierge team can assist with any of your tour requests, including tours of Las Vegas or the surrounding area such as the Hoover Dam and Grand Canyon. I’ve lost or left something at the hotel, can you help me find it? Please contact Security at the resort you lost it. Who can I contact regarding an item on my bill? Please contact the Front Desk at the property you’re staying at. How can I provide feedback on my stay? If you booked with us directly, we will be sending you a brief survey for feedback on your visit. If you would like to provide feedback during your stay, please contact our Guest Services team at the resort in which you are staying. ARIA opened December 16, 2009. How many rooms at ARIA? What is CityCenter in Las Vegas? The term “CityCenter” was used to describe the multi-resort development of ARIA, Vdara, Crystals and Veer Towers. “ARIA Campus” is now the term used to encompass this development area. How many stars is ARIA Las Vegas? ARIA consists of multiple room types with different ratings for AAA and Forbes. The ARIA Sky Suites are a 5 Diamond (AAA) & 5 Stars (Forbes) tower while the ARIA Las Vegas resort is a 5 Diamond (AAA) & 4 Stars (Forbes) resort on the Las Vegas Strip. Please feel free to explore and enjoy your mini bar. You may remove items for 60 seconds to review ingredients before purchasing. A menu has been provided on your in-room tablet under Guest Services. In-room mini bars are not set to the recommended food safety temperature of under 40° F (4° C). To request a personal fridge, please contact the Front Desk. Additional fees may apply. Construction on the Bellagio began in May 1996 and it opened October 15, 1998. How large are the Fountains of Bellagio? The Fountains of Bellagio have more than 1,200 dancing fountains on a lake of more than 8.5 acres of water. Click here for more information about the Fountains of Bellagio, including show times and videos. How many rooms are at the Bellagio hotel? Bellagio has 3,933 guest rooms, including 512 suites. What is the theme of Bellagio? Bellagio is inspired by the villages of Europe and is named for the city of Bellagio, Italy. How many stars is Bellagio? Bellagio is a 5 Diamond (AAA), 4 Star (Forbes) resort & casino on the Las Vegas Strip. Does Vdara have a casino? Vdara Hotel & Spa in Las Vegas is an exclusive, non-gaming, smoke-free environment. Guests wishing to visit a casino may visit nearby ARIA or Bellagio. Vdara Hotel & Spa is a 57 story tower-style hotel that opened December 1, 2009. Vdara Hotel & Spa is jointly owned by MGM Resorts International and Dubai World. How many rooms are at the Vdara resort? Vdara Hotel & Spa in Las Vegas has 1,495 suites. Is Vdara connected to Bellagio or ARIA? Vdara Hotel & Spa shares its parking portico with the ARIA Resort which connects via a short walkway; only a 2-minute walk from the Vdara. Bellagio is connected to the Vdara via a free tram which provides guests’ access to Bellagio, Vdara, ARIA, and the Shops at Crystals. How many stars is Vdara? Vdara Hotel & Spa is a 4 Diamond (AAA), 4 Stars (Forbes) resort on the Las Vegas Strip. How many rooms does the MGM Grand have? MGM Grand Las Vegas has 5,044 guest rooms, including 751 suites. Who owns the MGM Grand? The MGM Grand Las Vegas is owned by MGM Resorts International. Where is will call at MGM Grand Las Vegas? Will call will be located within the box offices. You may pick your will call tickets up at any of our Box Offices in the casino. There are unique ticket offices for each theater, please consult the property map or ask a staff member at the resort for directions. What year was the MGM Grand built? MGM Grand Las Vegas opened December 18, 1993. Does MGM Grand Las Vegas still have lions? No, the Lion Habitat at MGM Grand has closed. You can explore, learn and play in an enchanting world of Bottlenose Dolphins, White Tigers, White Lions and Leopards at the Secret Garden & Dolphin Habitat at The Mirage. How do I reserve VIP seats to KÀ? Many seat types can be purchased online at MGMResorts.com. For VIP package seats, please call Central Reservations at 855-788-6775. What happened to the Rainforest Café? The Rainforest Café at MGM Grand Las Vegas closed in 2015. The space is currently occupied by the new interactive gaming experience Level-Up. How big is the Lion Statue at the Front Entrance? The Front Entrance of MGM Grand Las Vegas features a 100,000-lbs bronze lion statue. The 45-foot-tall lion, perched atop a 25-foot pedestal, is the largest bronze statue in the U.S.
How many stars is the MGM Grand Las Vegas? The MGM Grand Las Vegas consists of multiple types of rooms with various ratings. The The MGM Grand overall is rated as a 4 Diamond (AAA) Resort on the Las Vegas Strip. While the MGM Skylofts are 5 Diamond (AAA) & 5 Stars (Forbes) suite and the MGM Grand West Wing King Rooms are 3 Diamond (AAA) rooms. Is the Signature connected to the MGM Grand? Yes, guests of the Signature at MGM Grand can access the MGM Grand Resort through an indoor walkway. Guests will need to use their room key card to access the walkway when returning from the MGM Grand. Does the Signature have a casino? No, The Signature at MGM Grand does not have a casino. It is connected via indoor walkway to the MGM Grand casino and is available for guests to use 24 hours a day. How big is The Signature at MGM Grand? The Signature at MGM Grand of three towers. Each tower is comprised of 576 suites, for a total of 1,750 rooms. How many stars is The Signature at MGM Grand? The Signature at MGM Grand is 4 Diamond (AAA) rated resort in Las Vegas. When was The Signature built? The Signature at MGM Grand was built in three phases, beginning in 2003. The first tower opened in 2006 for occupancy. How far is the Signature from The Strip? The Signature at MGM Grand is connected to the MGM Grand via a covered walkway. The walk to MGM Grand Las Vegas can take 10-12 minutes. Guests can also walk along E. Harmon St. to access the Las Vegas Strip directly. The walk is roughly the same, at 0.6 miles (0.9 km) or 12 minutes. When was the Mandalay Bay built? Mandalay Bay opened March 2, 1999. How many floors & rooms are in the Mandalay Bay Resort? Can I access the Mandalay Bay beach and pool area? Guests have access to the beach and pool areas at Mandalay Beach and the Delano Las Vegas. Non-guests can visit the pool with a cabana reservation, which can be made online. Non-Hotel guests are permitted at Moorea Beach Club, however entrance fees may apply. Who owns the Mandalay Bay? MGM Resorts International owns the Mandalay Bay resort. Is the Mandalay Bay pool open in the winter? Mandalay Bay has one pool open year round for guests. Can I get more information about the wave pool at Mandalay Bay and any restrictions for use? What happened to THE Hotel at Mandalay Bay? THE Hotel closed and Delano Las Vegas opened September 2, 2014[NHART1] [PL2] . Delano is a 64-level tower featuring 1,117 suites. Is Delano Las Vegas connected to Mandalay Bay? Yes, guests of Delano Las Vegas can access the Mandalay Bay through a connected corridor with shops and restaurants. How many stars are Mandalay Bay and Delano Las Vegas resorts? Mandalay Bay & Delano Las Vegas are both 4 Diamond (AAA) resorts on the Las Vegas Strip. Who developed and owns the Mirage Hotel & Casino resort? The Mirage Resort in Las Vegas was developed by Steve Wynn and opened November 22, 1989. It is currently owned and operated by MGM Resorts International. How many rooms and floors does the Mirage have? Mirage has 3,044 guest rooms, including 281 suites. Does the Mirage have tigers? Absolutely, in addition to tigers, the Secret Gardens at Mirage also have dolphins, lions, and leopards. There are many interactive experiences guests can enjoy at the Secret Gardens. Learn more about the Secret Garden & Dolphin Habitat at the Mirage Las Vegas. What time and how long is the Volcano Show at Mirage? The volcano show occurs at 8 and 9pm each night, with additional 10pm showings on Friday & Saturday. Each show lasts approximately five minutes. Fun fact - the volcano shoots fireballs more than 12 feet into the air! How many stars is the Mirage? The Mirage Hotel & Casino is a 4 Diamond (AAA) resort on the Las Vegas Strip. When was the New York-New York resort built and who owns it now? New York-New York opened January 3, 1997 and is owned and operated by MGM Resorts International. How many rooms and floors is the New York-New York resort? New York-New York has 2,024 rooms, including 104 suites. Is there live music at New York-New York? In addition to the live music in The Park and at the Brooklyn Bridge, guests are encourage to stop by the Bar at Times Square to experience the #1-rated dueling piano show in Las Vegas! How many stars is the New York-New York Hotel & Casino? The New York-New York Hotel & Casino is a 3 Diamond (AAA) resort on the Las Vegas Strip. When was Excalibur built and who owns it now? Excalibur Hotel & Casino opened June 19, 1990 and is owned by MGM Resorts International. How many rooms are at Excalibur? Excalibur Hotel & Casino has 3,981 guest rooms, including 41 suites. Can I rent medieval attire and get married at Excalibur? Absolutely! Learn more about wedding packages and royal attire on our website. How many stars is Excalibur Hotel & Casino? Excalibur Hotel & Casino is a 3-Diamond (AAA) resort on the Las Vegas Strip. Who owns the Luxor Resort? The Luxor Resort & Casino opened October 13, 1993 and is currently owned by MGM Resorts International. An addition of the twin 22-story towers opened April 1998. How many rooms are at the Luxor in Las Vegas? Luxor Resort & Casino and has 4,400 guest rooms, including 487 suites. What is the name of the pyramid hotel in Las Vegas? The iconic pyramid hotel on the Las Vegas Strip is the Luxor Hotel & Casino. It’s an Egyptian-themed resort with attractions such as Titanic: The Exhibition, Bodies: The Experience, comedian Carrot Top, Fantasy, and HyperX Esports Arena. How many stars is the Luxor Hotel? The Luxor Resort & Casino is a 3-Diamond (AAA) resort on the Las Vegas Strip. Has the Luxor been renovated? The casino floor has been renovated over the past few years. 500 pyramid rooms were remodeled in late 2016 to reveal the all new Cleo Rooms. Both Towers will be renovated in late 2017 through mid-2018. Is the Luxor built to scale & how tall is the pyramid? Luxor is 30 stories tall and slightly smaller than the original. How bright is the Luxor beam and can you see it from space? Approximately 42.3 billion candelas visible for up to 275 miles. It is visible from space when fully powered on. Is the Circus Circus Las Vegas still open? Yes, the Circus Circus Las Vegas is open and providing a fun-filled Las Vegas experience for all ages at an affordable price. How many floors does Circus Circus have? Who owns the Circus Circus Las Vegas? When was Circus Circus built? How many stars is Circus Circus? Circus Circus Las Vegas is a 2 Diamond (AAA) casino resort in Las Vegas. Beau Rivage opened March 15, 1999 in Biloxi, MS. It was developed by Steve Wynn and is currently owned & operated by MGM Resorts International. How many casinos are in Biloxi, MS? There are approximately 8 casinos in Biloxi, MS. Only Beau Rivage is owned and operated by MGM Resorts. Gold Strike is located in Tunica is a town in the county seat of Tunica County, Mississippi, near the Mississippi River, in the United States. What time is it in Tunica? Is the Gold Strike on the water? The Gold Strike Casino is located on the Mississippi River in Tunica, MS. Original gambling laws in Mississippi require casinos to be located on coast waters, but after Hurricane Katrina in 2005 the laws were updated to allow casino resorts to be located near the coastline. Due to its proximity to the Mississippi River, some hotel rooms have river views. How far is Tunica from Biloxi? 364 Miles, approximately a 6 hour drive. When was the MGM Grand Detroit built? The permanent casino resort, MGM Grand Detroit, opened to the public on October 3, 2007. Does the MGM Grand Detroit have a buffet? Yes. We do have a buffet at Palette Dining Studio. How many stars is the MGM Grand Detroit? The MGM Grand Detroit is a 4 Diamond (AAA), 4 Star (Forbes) resort in Detroit. When was the MGM National Harbor built and who owns it now? MGM National Harbor began construction in May 2014. It is owned and operated by MGM Resorts International. When did the MGM National Harbor open? The MGM National Harbor casino resort opened on December 8, 2016. MGM National Harbor has an unrivaled setting offering stunning panoramic views of the eastern shore of the Potomac River in Maryland. The $1.4 billion LEED® Gold Certified resort, sits a short distance from Washington, D.C. to the north and historic sites, including George Washington's Mount Vernon estate across the river in Virginia. How can I qualify for a casino rate? Visit any M life Rewards desk or speak with your host at the end of your stay to find out if you are eligible for a casino rate. Visit any M life Rewards desk to have your play evaluated or to speak with a host. How can I learn about promotions and events for which I am eligible? Log into your M life Rewards account and go to Find Personal Offers to view available offers or call 866.800.4668 for additional information. How can I access my Win/Loss (Tax) Statement? Sign in to your M life Rewards account and navigate to “Win/Loss (Tax) Info” in the top right corner by clicking on your name. Select the time period you would like to view. Your Win/Loss statement will automatically update based on your selection. Select “Print Win/Loss Info” for a printable form. How do I access my Win/Loss (Tax) Statement for Borgata? What is my Estimated Total Win/Loss? Does my statement include information from accounts linked to my M life Rewards account? No. Your statement only includes information recorded while using your M life Rewards card. Other linked players in your household may request their own statement. What information is included on my Win/Loss (Tax) Statement? Why doesn’t my statement show detailed information about daily sessions? Due to the large amount of information from our members, most reports would simply be too long to include this type of detail. Yes, FREEPLAY ® redeemed from POINTPlay ® expires 18 months from the date it was issued. FREEPLAY ® offered in conjunction with a special promotion may expire depending on the offer, please pay attention to the valid dates listed on any promotional offers you receive so you won't miss out on any FREEPLAY ® ! Why is my FREEPLAY ® balance different at each resort I visit? Slot points converted to FREEPLAY ® are available for play at the casino where converted. Do I still qualify for M life Rewards benefits when using POINTPlay ®? Yes! You'll qualify for free rooms, shows, dining, and more when using POINTPlay ®. POINTPlay ® gives you more of what you like best, FREEPLAY ® for your slot play. Redeem slot points when and where you want from your favorite games without waiting in line Visit the M life Rewards desk where a representative will help you to select a secure, four-digit Personal Identification Number or "PIN" for your M life Rewards account. A representative will also show you how to manage your account at the game using the game's keypad and M life Rewards menu options. To preserve the security of your M life Rewards account, never share your PIN with others. Do I need a different PIN for each M life Rewards casino I visit? Your PIN works at all M life Rewards casinos. No, points are not earned for table games play. In Las Vegas, M life Rewards members are eligible to earn Tier Credits based on their tables games play. In Mississippi and Michigan, M life Rewards members are eligible to earn both Express Comps and Tier Credits based on their table games play. Is there a minimum betting requirement to be rated for Table Games? Yes, please see the supervisor in the pit for assistance at each participating M life Rewards Destination. You earn Tier Credits for virtually every dollar you spend - including gaming - across all our M life Rewards Destinations For every dollar you spend on your hotel stay, dining, entertainment, or spa you earn Tier Credits - in Las Vegas you earn 25 Tier Credits per dollar spent; at Beau Rivage, Gold Strike Tunica, and MGM Grand Detroit you earn 8 Tier Credits per dollar spend. For slot play in Las Vegas M life casinos, you receive ten (10) Tier Credits for every Base Point earned. When playing at Beau Rivage or Gold Strike Tunica, you receive two (2) Tier Credits for every Base Point earned. At MGM Grand Detroit, you receive one (1) Tier Credit for every Base Point earned. For table games, you'll earn Tier Credits based on length of play, average bet, and game type. To ensure Tier Credits are credited to your M life Rewards account, always use your M life Rewards card while playing slots and table games at any participating MGM Resorts International destination. Also, show your M life Rewards card at the time of each qualifying purchase, or charge these purchases to your room and present your M life Rewards card to the Front Desk at the beginning of your stay. What is M life Rewards? M life Rewards is MGM Resorts International's loyalty program that gives you the power to earn benefits for virtually every dollar you spend. That means you'll be rewarded for enjoying hotel, dining, entertainment, and spa experiences, along with your slot and table play at any one of 15 MGM Resorts' destinations. Your play and spend are recognized as a single account making it easy to stay, play, and win wherever you like, whenever you like. Earn points, Express Comps, Tier Credits, and more! Advance your tier and earn even more benefits. In Las Vegas, Express Comps are earned while playing your favorite slots or video poker machines. In both Mississippi and Michigan, Express Comps are earned for playing table games, slots or video poker. What are M life Rewards Moments? With M life Rewards, it's all about the experience. M life Rewards Moments are the gateway to the ultimate experience exclusively for M life Rewards members. Sign in to mlife.com to see your available M life Rewards Moments, based on your tier, and you can access these unique experiences at participating MGM Resorts International destinations. Do all of your resorts offer the same tier benefits? There are some benefits that are available at all M life Rewards participating resorts and each also offers some additional benefits. Visit the M life Rewards desk in the resort or mlife.com to view available benefits by tier and resort. Where can I use my M life Rewards card? You may use your M life Rewards card and enjoy the benefits in Las Vegas at Bellagio, ARIA, Vdara, MGM Grand Las Vegas, The Signature at MGM Grand, Mandalay Bay, Delano Las Vegas, The Mirage, Park MGM, New York-New York, Luxor, and Excalibur; in Mississippi at Beau Rivage and Gold Strike Tunica; and in Michigan at MGM Grand Detroit. Express Comps are the fastest and most convenient way to self-comp at your favorite M life Rewards Destination. Members may earn up to $5,000 in Express Comps and NOIR Members may earn up to $10,000. Express Comps may be used for your hotel stay, at food and beverage outlets, entertainment venues, or to purchase your M life Rewards Moments. Members do not earn Tier Credits when using their Express Comps. A member's accumulated points and Express Comps may be subject to forfeiture if the member's M life Rewards account does not reflect any activity (which means earning points or earning Tier Credits) for a period of six (6) months for Sapphire Members or a period of twelve (12) months for Pearl, Gold, Platinum and NOIR Members. When does my tier expire? Tiers expire on October 1 each year. Tier Credits earned from October 1 to September 30 qualify you for your tier beginning each October 1. If you advance to a higher tier at any time, you'll enjoy those benefits for at least one full year. What are Tier Multipliers and how do they work? Qualify for the M life Rewards tiers by increasing your Tier Credits with play at slots and/or table games as well as spend on lodging, dining, and entertainment. New M life Rewards members qualify for the benefits of the Sapphire tier. Earn Pearl at 25,000 Tier Credits, Gold at 75,000 Tier Credits and Platinum at 200,000 Tier Credits. NOIR is by invitation only. Where can I redeem my Express Comps? Look for "Express Comps Accepted Here" signs at participating restaurants, box offices, and more! Express Comps are not redeemable at retail outlets. How do linked accounts work? Two members with the same address may link individual M life Rewards accounts to share their tier, Tier Credit and Express Comps balances. Both members must visit an M life desk in the resort and show a valid identification to link accounts. M life maintains separate account numbers and account histories for every member. Restrictions apply at MGM Grand Detroit and Borgata. What do I do if my Tier Credits were not credited to my M life Rewards account properly? Only individual purchases (e.g. cash, personal credit cards, and debit cards) for hotel room charges, entertainment tickets, food & beverage, spa & salon, attractions, and wedding charges (excluding tax, retail, and gratuity) are eligible to be posted to your M life Rewards account. Corporate credit/debit cards may not be used to earn Tier Credits. On the receipt, please provide your full name, M life account number, resort name, and contact information. Please allow up to 72 hours after we receive the request for the adjustment to post to your M life account. How do I access M life Rewards Moments? You can purchase M life Rewards Moments using your Express Comps or cash/credit card at mlife.com, the Concierge, or a Casino Host. Does mlife.com offer online gaming? mlife.com and MGM Resorts International do not offer online gaming. How can I unlink my account from another Player? Either linked member may visit any M life desk to request that his or her account be unlinked. Points are earned while playing your favorite slots or video poker machines. How often will I receive credit for my Bonus Points? Bonus Points will be credited to your M life Rewards account as soon as your playing session is complete. To view your updated point balance, remove your card, reinsert it, enter your PIN, and access the POINTS menu option. Or, you can always view your current point balance on mlife.com. When do I earn Points and Tier Credits for my spend on the M life Rewards MasterCard? Points and Tier Credits from your M life Rewards MasterCard spend are earned at the close of your monthly billing cycle. It may take up to 7 - 10 days from your billing cycle close date for Points and Tier Credits to be applied to your M life Rewards account. Do I have to be a US resident to apply for the M life Rewards MasterCard? Yes, only M life Rewards members with a US resident address are eligible to apply. How can using my M life Rewards MasterCard help me get back to my favorite M life Rewards destination even faster? You earn rewards everywhere you make purchases with your M life Rewards MasterCard. For example, with each $1 spent on gas or at the supermarket you will earn 2 Points and 2 Tier Credits1. So now you can turn refueling at the pump into a relaxing trip at the spa. How quickly will I be upgraded to Pearl Status after I'm approved for the M life Rewards MasterCard3? It may take 7-10 days for the Pearl Status upgrade to be reflected on your M life Rewards account. Please see the Summary of Credit Terms for important information on rates, fees, costs, conditions and limitations.For additional information about AnnualPercentage Rates (APRs), fees and other costs, please see the Summary of Credit Terms. What is Best Rate Guarantee? By booking directly with mlife.com or any of our M life Rewards Destinations you will receive the lowest published rate available. If a lower rate is found, it will be honored plus an additional 10% discount. How do I submit a Best Rate Guarantee claim? Click here to access the Best Rate Guarantee submission form and view claim requirements. Please read all the terms and conditions prior to submission. Claims can be submitted via fax or email along with proof of claim. When is Holiday Gift Shoppe 2019? 2019’s Holiday Gift Shoppe will be hosted at participating Las Vegas M life Rewards destinations. Please check back with us soon for event information including the hours of operation. Which MGM Resorts Destinations participate in the Holiday Gift Shoppe? Only Las Vegas M life Rewards Destinations participate in Holiday Gift Shoppe: Bellagio, ARIA, MGM Grand Las Vegas, Mandalay Bay, The Mirage, Park MGM, New York-New York, Luxor and Excalibur participate in the Holiday Gift Shoppe. Unfortunately you cannot earn Gift Points at Beau Rivage, Gold Strike, Borgata, MGM Grand Detroit, and MGM National Harbor. Do I have to attend a Holiday Gift Shoppe event in person to redeem my Gift Points? Yes, Gift Points must be redeemed in person in Las Vegas at a Holiday Gift Shoppe event. When may I redeem Holiday Gift Shoppe Points? Players redeem their Gift Points at exciting Holiday Gift Shoppe events held at participating Las Vegas M life Rewards Destinations during an end of the year shopping extravaganza. Unredeemed Gift Points do not carry over to the next year and expire at 06:00PM PDT on Sunday, December 2, 2018. May I combine my Gift Points with persons other than my linked account? Only two people who have established a linked account may combine Gift Points. Can I earn Holiday Gift Shoppe Points for table games play? No, Gift Points are earned the same way M life Rewards points are earned, based on slot play. Who should I contact with shipping related questions regarding Holiday Gift Shoppe? Does my M life Rewards card get me benefits at Borgata? Present your valid M life Gold, Platinum or NOIR card at the My Borgata Rewards Center at and receive immediate upgrade to Black Label status with My Borgata Rewards. Is Borgata now part of M life Rewards? As of August 1, 2016, Borgata is now an MGM Resorts Luxury Destination. This means Borgata joins the same family as your favorite M life resort destinations! Borgata will continue to offer the My Borgata Rewards loyalty program. My Borgata Rewards will become M life Rewards in 2017. Current status, balances and offers will all be maintained when the transition occurs. We will be sure to keep you updated with additional details, including more precise timing. Will my M life offers change? Your offers at M life Rewards destinations will continue be based on your play and spend using your M life Rewards card. Visit mlife.com to view balances, offers, and to make reservations. If I am headed to Borgata soon, should I sign up for My Borgata Rewards? Absolutely! Rewards from both programs will be combined when the program is transitioned next year. Where can I learn more about Borgata or My Borgata Rewards? Click here to explore and discover all that Borgata has to offer. Don’t have a My Borgata Rewards card? Click here to enroll. As an M life Rewards Member, can I earn rewards redeemable at Borgata? Some M life Rewards members may receive exclusive offers and invitations via mail or email for Borgata. Continue to use your M life Rewards card when playing at MGM Resorts Destinations. The MGM Resorts International Gift Card is accepted at participating destinations' merchant and restaurant outlets listed here. The Gift Card cannot be used to make reservations or advance purchases, such as show tickets or room reservations.Gift Cards may not be used for gaming activities, hotel reservations or advanced purchases, and are not redeemable for cash. See the Cardholder Agreement for a complete list of terms and conditions. Funds on the Gift Card do not expire. Unless prohibited by law, a monthly inactivity fee of $2.50 will be deducted from the Gift Card after thirteen months of inactivity. The amount remaining on the Card will be available until the amount reaches zero. Unless prohibited by law, a $2.50 fee will be deducted monthly from the Gift Card after thirteen months of inactivity. Activity is defined as any action resulting in a charge on the Gift Card balance, other than fee imposition, or adjustment due to error or prior transaction reversal. For inquiries on the Gift Card transaction history, please visit transcardgift.com or call 1-800-554-2707. Some merchants may charge a processing/service fee. Subject to the outlet’s return policy, merchants may credit balances back to the Gift Card used to make the original purchase. For this reason, it is very important that customers keep Gift Cards and receipts. Funds credited by the merchant will be available in 3-5 days after the return is processed. If the physical Gift Card is not present, the merchant may issue a store credit, store valued Gift Card, or allow an exchange. Voided transactions may take up to 7 days to be credited back to the Gift Card's available balance. It is important to store your Gift Card Admin number and purchase receipt in a safe location in the event your Gift Card is lost or stolen. Your Gift Card must be registered at transcard.com to file a dispute on unauthorized charges. To prevent unauthorized charges on a lost/stolen card, contact the Gift Card selling location immediately to have your card locked. Gift Cards may be replaced for a fee of $10.00; Gift Card Admin number and proof of purchase are required for replacement. See Cardholder Agreement for more details. How do I find the available balance on the Gift Card? The available balance should be indicated in the first white box located on the back of the Gift Card upon initial purchase. You may confirm the available balance at any one of our Gift Card selling locations, online at transcardgift.com or call 1-800-554-2707. Can I add funds to my Gift Card? No, the Gift Card is not re-loadable; however, returns and credit amounts can be placed back on to the card by a merchant. Can I order a Gift Card with a credit card outside the U.S.? At this time, the MGM Resorts International Gift Card cannot accept foreign shipping credit cards or mailing addresses. Can I order a Gift Card to be mailed to a P.O. box? No, the MGM Resorts International Gift Card requires a non-P.O. box address for mailing and billing confirmation for your credit card. I purchased a Gift Card at Costco, where is it valid? The MGM Resorts International Gift Card purchased at Costco is accepted at MGM Resorts International destinations but cannot be used at retail outlets. I purchased an MGM Resorts International Circus Circus Reno Gift Card, where is it valid? Effective 7/27/15, MGM Resorts International Gift Cards are no longer valid at Circus Circus Reno.Your MGM Resorts International Gift Card is accepted at participating destinations' merchant and restaurant outlets listed here. The Gift Card cannot be used to make reservations or advance purchases, such as show tickets or room reservations. Gift Cards may not be used for gaming activities, hotel reservations or advanced purchases, and are not redeemable for cash. See the Cardholder Agreement for a complete list of terms and conditions. I purchased an MGM Resorts International Gift Card. May I still use this at The Shops at Crystals? Effective May 2016, MGM Resorts International Gift Cards are no longer valid at The Shops at Crystals. Our MGM Resorts International Gift Card is accepted at participating destinations listed here. What should I do if I accidentally enrolled online more than once or the account number I received after enrolling online does not match the number on my M life Rewards card? Click here to send a message to M life Rewards Member Services. I forgot my M life Rewards account number. Where can I retrieve this information? Please call M life Rewards Member Services at 866.761.7111 to obtain your M life Rewards account number. You can also find your M life Rewards account number on the Profile section of your account on mlife.com. How can I access my account if I have forgotten or lost my password? Click "Sign In" and then click "Forgot Your Password?" Follow the instructions provided. Your Password and PIN must be set up individually of each other. Where can I get my M life Rewards card? Visit any M life Rewards desk during your next visit to a participating MGM Resort to receive your M life Rewards card. We cannot mail your card to you. Why did MGM Resorts implement parking fees? After extensive review and analysis, MGM Resorts launched a $90 million parking strategy to expand and enhance parking infrastructure and the parking experience. This strategy will address the long-term increase in visitation to Las Vegas along with changing consumer tastes and demands. We are building a new $54 million parking facility near the northwest corner of Excalibur to absorb further growth and to enhance the experience for attendees of events at the T-Mobile Arena and other nearby resorts and entertainment venues. We are investing an additional $36 million in upgrades and enhancements to our existing parking facilities. How does fee parking work? Similar to many other modern parking facilities, guests receive a ticket on entry and pay prior to returning to their cars. Parking enhancements being made as part of the overall program will enable guests to quickly find an available spot by following new dynamic signs and LED guidance lights. Pay On-Foot stations allow guests to pay before returning to their vehicles and exit seamlessly. Is there a grace period for brief visits? Will I be charged right away? In Self-Park facilities, the first hour will be complimentary. This will accommodate brief errands, appointments, deliveries, and pick-ups, without having to pay. Vehicles that are self-parked for over one hour will be subject to a parking fee. The self-parking fee is $9 for vehicles parked over 1 to 2 hours, $15 for vehicles parked over 2 hours to 4 hours, $18 for vehicles parked over 4 hours to 24 hours at the following resorts: ARIA and Bellagio. For vehicles that are self-parked at these resorts over 24 hours, there is an additional self-parking fee of $18 for each additional day or fraction thereof. The self-parking fee is $9 for vehicles parked over 1 hour to 2 hours, $12 for vehicles parked over 2 hours to 4 hours, $15 for vehicles parked over 4 hours to 24 hours at the following resorts: MGM Grand, Mandalay Bay, Mirage, Park MGM and New York-New York. For vehicles parked at these resorts over 24 hours, there is an additional self-parking fee of $15 for each additional day or fraction thereof. The self-parking fee is $6 for vehicles parked over 1 to 2 hours, $8 for vehicles parked over 2 hours to 4 hours, $10 for vehicles parked over 4 hours to 24 hours at the following resorts: Luxor and Excalibur. For vehicles parked at these resorts over 24 hours, there is an additional self-parking fee of $10 for each additional day or fraction thereof. Is there a fee for valet parking? The valet parking fee is $21 for the first 2 hours (no grace period) and $24 for over 2 hours to 4 hours, $30 for over 4 hours to 24 hours at the following resorts: ARIA, Bellagio & Vdara. For vehicles that are valet parked at these resorts over 24 hours, there is an additional valet parking fee of $30 for each additional day or fraction thereof. The valet parking fee is $16 for the first 2 hours (no grace period), $18 for over 2 hours to 4 hours, and $24 for over 4 hours to 24 hours at the following resorts: MGM Grand, Mandalay Bay, Delano, Mirage, Park MGM and New York-New York. For vehicles that are valet parked at these resorts over 24 hours, there is an additional valet parking fee of $24 for each additional day or fraction thereof. The valet parking fee is $12 for the first 2 hours (no grace period), $14 for over 2 hours to 4 hours and $16 for over 4 hours to 24 hours at the following resorts: Luxor, Excalibur and Circus Circus. For vehicles that are valet parked at these resorts over 24 hours, there is an additional valet parking fee of $16 for each additional day or fraction thereof. How does the valet process work? If you are a non-hotel guest, you should stop at a Self-Service Valet kiosk or valet booth, scan your Valet ticket and pay the charge with cash or credit with the booth cashier or credit card only at the self-service valet kiosk. Hotel guest Valet parking fee will be automatically charged to the room folio. When the valet ticket is paid, the system will signal for the car to be retrieved. Use your ticket to retrieve your vehicle. Is there a grace period for Valet? There is no complimentary period for valet as there is in Self-Park. All valet customers will be charged based on the time they receive a ticket from the valet attendant. How do Hotel Guests who pay for Self-Parking access Self-Park facilities at other MGM resorts? If a guest has paid for Self-Parking on their room account, their room key will give them access to other MGM Resort Self-Park facilities during their stay at no additional charge. Once I check out of my room on departure day, how long will the room key remain active for Self Park? The room key will remain active until 11:59 pm on the departure date. What happens if a Self-Park ticket is lost? Guests will be instructed to use the call button on the Pay-On-Foot kiosk to contact the Command Center. The parking staff will attempt to determine how long your vehicle has been parked so that the correct amount can be charged. Otherwise, you will be charged a lost ticket parking fee of $30.00. The Valet system registers when every car when it arrives. We can accurately calculate your total fee. How long can a guest leave their car in Valet? Is there an extended rate? There is no reduced rate for extended valet parking. When the vehicle is picked up the customer will be charged full valet rates for as many days as the vehicle was parked. How do I tip a Valet Attendant for good service? The same way you always have in Las Vegas – by offering the attendant a cash tip when you are handed your keys. Tipping is appreciated, but has always been at the discretion of the customer and will remain so. Can a Hotel Guest leave a valet tip on their room account? No. Cash tips can be offered at valet pick-up. Will the payment kiosk have an option to add tip? Pay-on-Foot kiosks will accept payment for parking fees, but currently do not have the ability to add tips to a credit card payment. If you are a Registered Hotel Guest and have paid the overnight Valet rate, will you have to pay again if you return before midnight? Will you have to pay at other MGM resorts during the same day? Registered hotel guests at MGM Resorts hotels who pay the 24 hour valet parking fee at their home resort receive free parking during that time at all MGM resorts (self or valet), subject to availability. If a Valet customer returns the same day will he be charged again? Yes. Valet is a fee for service. Unless you are a Registered Hotel Guest, once you leave you will pay again if you return and use the service again. My M life Rewards status qualifies me for free parking. How will I activate that benefit? OR Take a ticket as you enter and use a Pay-on-Foot Kiosk as you depart the resort. Insert your M life Rewards card when payment is requested and your parking fee will be waived. What M life Rewards tier earns the free parking benefit? M life Rewards members who have achieved Pearl Tier Level and above are eligible for free Self-Parking, subject to availability. Gold Tier Level and above are eligible for free Valet parking, subject to availability. M life Rewards members will need to have their valid M life Rewards membership card with them to use their parking benefit. Do M life Rewards members who qualify for free parking need to have their M life Rewards card with them when they use the free parking benefit? M life Rewards members who are Pearl Tier Level and higher are eligible for free parking. You must have your valid M life Rewards card with them when parking in order to utilize the benefit. An eligible guest who does not have his/her card can go to the M life Rewards Desk and request a new card. The new valid M life Rewards card can then be used on departure to utilize the free parking benefit, if eligible. The M life Rewards Mastercard can also be used to validate parking. Simply enter the Mastercard itself into the slot marked for Pearl Tier Level and above members. What is the process for an M life Rewards guest to utilize their free Valet benefit? M life Rewards members who have achieved Gold Tier Level and higher are eligible for free Valet, subject to availability. Guest must have their M life Rewards card with them to receive free parking benefit. Valet attendant will use a handheld scanner to swipe the guest’s M life Rewards card on arrival. The system will apply the free parking benefit to the guest’s valet ticket. As the M life Rewards guest departs the resort, they must stop at a Self-Service Valet kiosk or Valet booth, scan their Valet ticket and show their M life Rewards card to the booth cashier or swipe their M life Rewards card at the self-service valet kiosk. The parking benefit will be applied to their parking fee. When the valet ticket is paid, the system will signal for the car to be retrieved. When it is pulled up, the M life Rewards member will hand the paid ticket to the Valet to claim their vehicle. If the M life Rewards card was not swiped on arrival, the Valet attendant will ask to see the card, or, if using a kiosk, the guest will receive a prompt to swipe their M life Rewards card. Does the M life Rewards parking benefit include Event Parking? Yes. Free parking for eligible M life Rewards members extends to Event Parking, subject to availability, when in effect at MGM Resorts venues. The M life Rewards parking benefit is not available at the following garages during Vegas Golden Knights home games: The New York-New York garage (entrance from Frank Sinatra Drive) and the ARIA Event Parking Garage. M life Rewards members will need to have their valid M life Rewards card with them to use their parking benefit. Can an M life Rewards guest share their card with another guest or have multiple active cards? M life Rewards members may not share duplicate cards for parking benefits. Any unauthorized use of duplicate M life Rewards cards to share parking benefits is subject to account deactivation. M life Rewards cards will only activate parking gates once within a certain day period. Utilizing multiple cards, especially with friends or family members traveling together, will allow only the first user to open the gate. Subsequent users will be charged for their parking. Can I start using my free parking benefits the same day if my M life Rewards tier level advances during my stay? Tier updates are typically made within 24 hours. If your tier status advances during your stay, your parking benefit could be active the next time you enter one of our parking facilities. Does parking count toward M life Rewards Tier Credits? Parking charges paid on hotel room folios will be automatically credited to a guest’s M life Rewards account. Parking fees paid at kiosks will not be automatically posted. Guests can take their paid parking receipt to the M life Rewards desk in any resort and have Tier Credits posted to their account. How does multi-resort pass work for Registered Hotel Guests? Hotel guests utilizing Self-Park use their room-key to access parking facilities. Hotel guests who choose to Valet receive a special Valet ticket when they park at their home resort. That ticket remains with them for the duration of their stay. It allows them to valet park at any MGM Resort property without having to pay again, subject to availability. Additional details will be available at check in. How does the system know I am a registered hotel guest when I arrive and am eligible for the multi-resort benefit? Valet guests show their special valet ticket at check-in and it will be linked to their room account. Self-Park guests show their parking ticket at check-in and use their guest room key card to open parking gates during their stay. Are Registered Hotel Guests subject to Event Parking rates? Can a Hotel Guest who has paid for Valet parking, utilize Valet at other MGM Resort properties in Las Vegas at no extra charge? Yes, a Valet Hotel Guest can valet at all MGM Resorts properties at no extra fee. Their home resort Valet ticket will be valid for all locations, subject to availability. Valet is limited to availability. If Valet is full at other resorts, guests will be offered Self-Park at no charge, subject to availability. If a Hotel Guest paid for Valet, will they have access to Self park areas? No, except in the limited circumstances outlined above, hotel guests who pay for Valet should park in Valet at other resorts. If another resort is unable to accommodate them in Valet, the guest will be given access to Self-Parking at no charge, subject to availability. Do MGM Resorts employees have to pay for parking during their work shifts? Employees who follow proper parking guidelines, as outlined by their individual property HR Department, park for free in designated employee parking areas. Employees who do not follow employee parking guidelines may be subject to disciplinary action and any applicable parking fees. Do MGM Resort vendor and tenant employees have to pay to park when they are on shift? Vendor and tenant employees who follow proper parking guidelines, as outlined by the individual property, park for free in designated employee parking areas. During major events at one of our three Strip arena venues – T-Mobile Arena, the MGM Grand Garden, and the Mandalay Bay Events Center – resorts may implement Event Parking as a traffic control measure. This is part of an overall traffic control plan to help alleviate congestion near the event venue. My M life tier status gives me a free parking benefit. Do I get to park free during Event Parking? Yes. M life members need to have their valid M life Rewards membership card with them to use their parking benefit. What time will Event Pricing go into effect on event nights? Event Parking will be in effect for vehicles arriving between 4:00 p.m. to 11:00 p.m. in designated parking facilities on designated event nights. Vehicles parking in these facilities during these periods are encouraged to purchase Reserved Event Parking in advance, available online at lasvegas.parkmobile.com. Does Event Parking apply to any surrounding properties on event nights? Will a Registered Hotel Guest at an event resort be subject to Event Parking rates? No. Registered guests of resorts in Event Pricing status will be charged regular resort parking rates. Are two-wheeled vehicles subject to parking fees? No. Motorcycles are not subject to parking fees. Motorcycles should drive around entry and exit gates without pulling a parking ticket. How long can a guest leave their car in Self-Park? Are long term parking rates available? There is no time limit for how long a guest can park. But there is no discount for long term stays. Daily rates will apply. If I park for an extended period, can’t I just say I lost my ticket and pay that rate? We will generally be able to determine how long a vehicle has been parked in a garage and, in most cases, we will be able to charge the actual amount owed. The self-parking Lost Ticket fee, which is $30, is a last resort and will only be used in rare instances. Can a guest print out a receipt? Yes, Pay-on-Foot kiosks print receipts. The kiosk will prompt the guest to select the receipt option. If I host a dinner or special event and want to cover parking fees for my invited guests, how will I do that? If I am arriving for a job interview at your resort, will I have to pay for parking? No. Your parking fee will be waived by the department with which you are interviewing. There is sometimes a long wait to exit a garage. How long does a guest have between paying at the kiosk and exiting the parking facility gate? A guest has 60 minutes to depart the parking facility after paying at a Pay-On-Foot kiosk. This should provide ample time to exit even during events. Is there any incentive for electric/hybrid vehicles? We will continue to offer preferred parking and charging stations for electric and hybrid vehicles at many of our resorts, subject to availability. Hybrid and electric vehicles will be charged regular parking rates. If renting a car on property, do renters have to pay for parking? Rental car companies will issue a card for your first exit from the facility. Rental cars parked in our facilities are subject to the same rates as other vehicles. When returning a rental vehicle, take ticket on entering parking facility, and turn it in to rental attendant with your vehicle keys. What if my room key is demagnetized and I am not at the MGM Resorts hotel where I am a registered guest? You will need to pay for parking upon exit and then to return to the Front Desk of your home resort to have a new key magnetized. Turn in the valid parking receipt for reimbursement at your home hotel. What rate will be charged for ADA accessible parking spaces? All MGM Resort parking facilities offer the required amount of ADA accessible parking. ADA accessible parking is offered on a space available basis and charged at the same rate as other parking. Will oversized parking be a higher fee? Resorts that have oversize parking areas will charge regular parking rates. For Mirage, $15/$30 per day (0-24 hours) depending on length of vehicle. No grace period, M life Rewards discount, or local discount. Fees can be paid by cash or credit at the oversized lot and cannot be charged to the room. Is fee parking limited to parking facilities or will guests parking in surface lots also be charged? Resort surface lots are part of the fee parking program and will charge the same rates as garage facilities. What will you do if I cannot pay my parking bill? Parking staff will take your information and arrange to bill you. Has the security of exits and entrances been enhanced? Yes. All entry/exits of our parking facilities are being upgraded. Lighting, cameras, and other aspects of the facilities are being enhanced for comfort, ease of circulation, and safety. A Central Parking Command Center has live operators on duty 24/7 who will be able to assist guests. Guests may contact the Command Center from any entry/exit point. Can Hotel Guests use their room key to open gates for multiple cars or for other guests? No. The system is configured to allow exit gates to open only once over a set period of time, preventing guests from sharing their key with other drivers. Who can I turn to if I need assistance? Each of our Entry/Exit gates has a call button that can connect you with someone in our 24-hour Parking Command Center. Call buttons are also available on our Payment Kiosks located in our resorts and parking facilities. Each parking facility will also be staffed by employees and supervisors from SP+, our professional parking partner. Any member of the SP+ team will be able to assist you. Yes! First, we want to thank you for your service. The Military Veteran Program at MGM Resorts is available to any active duty military, members of the National Guard & Reserve, retired military, prior service and spouse of eligible military personnel. MVP members receive special discounts on rooms, restaurants, shows and attractions. Learn more about the program and its special offers on our Military Veteran Program (MVP) page. What is the MGM Resorts Application Process? Once you submit your application, a recruiter will carefully review it. If you are among the candidates selected to interview, you will be contacted regarding the next steps in the hiring process. Depending on the position, you may receive several emails from a number of different sources. We contract with third party vendors to handle parts of the hiring process like Video Interviews, Background Verification and Drug Testing. It is important to review all emails and follow any instructions they contain. When you're excited about a company, it's natural to want to apply to several different positions. Before you apply for a position, review the job description carefully to make sure you have the right skills and qualifications to be considered for the position. The best strategy to landing a job with MGM Resorts International is to present yourself as the best candidate. Multiple job applications will not increase your chances to join our team. You will only be able to have 3 active applications at a given time. How do I withdraw my application for a position? To remove yourself from consideration for any of your active applications, please email talent@mgmresorts.com with the job title, the requisition number and your full name and pone number. It may take up to 3 business days to update your profile. Is a computer required to apply for a job with MGM Resorts? You can apply for a job with MGM Resorts using a desktop computer, laptop computer or mobile device such as a tablet. Applicants who require assistance accessing a computer or mobile device to complete their application can seek assistance through their local or regional One Stop Career Center. What is HireVue and how do I complete a Video Interview? For some of our positions, candidates will receive an email to complete a Video Interview from HireVue. The email includes a link and instructions for support and tips for a successful interview. You can complete the interview at your convenience using a smart phone, tablet or desktop computer equipped with a camera. Video interviews take about 30 minutes. I received an email to take an assessment. What is this about? Will I know if I pass or fail? What happens if I fail? What happens if I pass? We use pre-employment assessments to learn more about you, your preferred work style and your strengths and abilities. There is no right or wrong answers but your answers will help us determine your suitability for the position which you applied. A pre-employment assessment takes about 30 minutes to complete and is best performed on a desktop computer. You will be notified once you have successfully completed the assessment. If I do not get an interview for a position, how long will I remain on file? If you did not meet the requirements for the position you applied to, your results will remain on file for 6 months at which time you can reapply for the same position. You are welcome to consider applying to other positions that you feel you are qualified to perform. If I am an existing employee of MGM Resorts International, will I be eligible to apply for other roles? Yes, as long as you meet the requirements for an internal transfer. MGM Resorts employees must apply through the internal careers site. Can I check to see what applications I have submitted? What is the WOTC email I received? The Work Opportunity Tax Credit (WOTC) is a federal tax credit available to employers for hiring individuals from certain target groups who have consistently faced significant barriers to employment. It is a workforce program that incentivizes workplace diversity and facilitates access to good job opportunities. What if I have forgotten my username/password? If you forget your password, you can request a password reset by simply clicking on the “Forgot Password” link that is found on the sign-in page. Your username is the email address you used when creating your candidate profile. What benefits (mainly insurance) do MGM Resorts provide and when do they begin? We offer extensive benefits and employee services that include important core benefits such as a choice of health care options, a 401(k) Savings Plan and life insurance. In addition, we offer a full spectrum of services and programs designed to enhance work and home life, as well as overall job satisfaction. Eligibility for the various benefits differs based on job classification and length of service with our Company. To learn more about our benefits, click here. Is hospitality experience required to work at MGM Resorts? MGM Resorts International offers a wide variety of career opportunities which require different knowledge, skills and abilities. Our job postings will provide detailed information about job requirements so that candidates are able to determine whether they meet the necessary criteria for the position. As an individual seeking a disability accommodation for completing my application, where may I find assistance? MGM Resorts International seeks to employ all qualified individuals and partners. Candidates are recommended to begin with their local or regional One Stop Career Center to gain support with seeking accommodations to complete the employment application. Candidates with further questions related to ADA compliance and accommodations should email us HERE. Does MGM Resorts International offer programs for college students? MGM Resorts International offers multiple programs for college students, including internships and post graduate roles. Candidates with questions related to MGM college careers should email us HERE. I live in another country, can I apply for a job? If you are legally eligible to work in the United States, you can apply for any position within MGM Resorts International. Why did I receive an email from HireRight? What do I need to complete? Once you accept an Offer of Employment, you will receive email instructions from HireRight, our third party vendor who conducts background investigations. The email will provide a link to a secure online form to collect the necessary information for your background verification.You must complete this form within 48 hours of notification.If you have any questions about the background check process, click here to contact us. Why did I receive an email from Workday about drug testing? What do I need to do? Once you accept an Offer of Employment you will receive email instructions from Workday. The email will contain directions to our third party vendor HireRight, who conducts pre-employment drug testing. The email will contain their office location, hours of operation and a donor ID.You must submit your drug test at the HireRight location within 48 hours of notification. What happens after I complete my pre-hire Background Check and Drug Test? Once your pre-hire Background Check and Drug Test have cleared, you will receive a phone call from MGM Resorts International Employment to schedule processing. At that time, you will receive emails from Workday, our core HR system, to set up your Employee Profile. Access to exclusive and personalized offers. Enjoy all M life Rewards has to offer.